The National Rail Enquiries website has details of the station itself. The station is staffed on a part-time basis - Monday-Saturday 06:40-20:30, Sunday 09:40-17:00. There is a ladies' toilet, gentlemen’s toilet and disabled access toilet on Platform 2. The toilets are only available when the station is staffed. There are heated waiting rooms on both platforms where an exhibition can be viewed and books can be exchanged or borrowed from a small library. The Platform 2 waiting room has a piano. The independent cafe is on Platform 2 and can be accessed from the platform and the doors are accessible for wheelchair users. Opening hours are 6 am to 3 pm Mon - Fri and 9 am to 3 pm Sat. The cafe serves freshly prepared hot food, snacks, homemade cakes, a range of teas and coffees, cold drinks including some beers. The cafe also sells some newspapers. A card-operated telephone box is situated on the station forecourt. Hebden Bridge is a Grade 2 station. Stations are graded on footfall and only Grade 3 and above are required to have full disabled access. The closest Grade 3 stations are Halifax and Rochdale. There are two parking bays for Blue-Badge holders, however only Platform 2 eastbound is fully accessible: trains from Manchester to Leeds/York. To access Platform 1, trains to Manchester and Blackpool, requires descending a very steep flight of stone steps and walking through an underpass. There is a slope up to Platform 1 with only 2 or 3 steps to negotiate. However the slope is very steep, too steep for normal wheelchair access. Problems are similar for parents with buggies. There is no lift at Hebden Bridge station; as it is a Grade 2 station, a lift is not mandatory. Northern's Disabled People's Protection Policy states that because Hebden Bridge station is inaccessible, they will provide a taxi to/from the nearest accessible station when required. There is only one 2nd class wheelchair space per train and this is not bookable on local trains i.e those through Hebden Bridge. So if there is already a wheelchair user on board you will have to wait for the next train. However if you are catching an inter-city train in a wheelchair you are required to book at least 24hrs in advance. If you are interested in efforts to improve accessibility at Hebden Bridge Station, please look at the Access for All webpage. Mytholmroyd station provides ramped access to both platforms. Sowerby Bridge station is wheelchair-accessible from the car park for trains to Manchester and there is a ramped subway to the Leeds platform. Todmorden station is wheelchair-accessible from the car park for trains to Manchester. All trains operated by Northern carry ramps and the conductors have to operate them. All trains serving Mytholmroyd, Sowerby Bridge, Todmorden, Leeds and Manchester carry ramps, and staff are instructed to deploy them. Detailed information for disabled passengers is available on the National Rail accessibility webpage. There is a 24-hour car park with 78 spaces for rail users opposite the station entrance. This is currently free, but is usually fully occupied from early morning onwards. There is a smaller 24-hour long-stay car park in Station Road. This has a height restriction so may be problematic for some vehicles. It is not free, but the charge is 30p an hour up to 4 hours, £1.50 for over 4 hours and on Saturday it is £1 for any duration. There are other public car parks in the town centre, although these are often very busy on public holidays. There are some Sheffield bike stands on Platform 2. 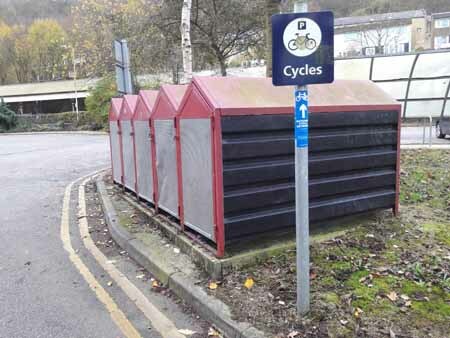 There are covered stands and ten secure cycle lockers adjacent to the station car park. One of the blocks of cycle lockers, strengthened to provide more security with the covered stands in the background.